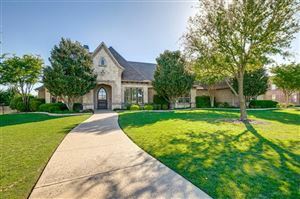 Buffalo Creek is one of the most prestigious neighborhoods in Rockwall County. It's a collection of homes that range from cozy patio homes on small lots to grand estates on acreage near Lake Ray Hubbard. The homes wind around rolling hills and the premier Buffalo Creek Golf Club designed by Jay Morrish and Tom Weiskopf. The neighborhood amenities include a playground, two swimming pools, and 5 tennis courts which makes it the only neighborhood in Heath with any of the amenities listed. The tennis courts are managed by 2 tennis pros and they offer lessons for all ages and coordinate fun tournaments and mixers. The HOA is run by Real Manage and there are 9 board members dedicated to making this even more desirable! Very few houses in the area that are beautiful and have fabulous amenities are one story but in Buffalo Creek there are a few. Click HERE to see homes for sale in Buffalo Creek. Elementary school age children go to Pullen Elementary school. This elementary school has the highest parent volunteer hours per year of any of the Rockwall ISD schools. Middle school children go to Cain Middle School and high schoolers go to Rockwall-Heath High School. Rockwall-Heath High School is known for it's outstanding athletic department (2012 State Baseball Champions) and excellent Fine Arts programs. Updated Apr 24, 2019 10:27:am. Based on information from the North Texas Real Estate Information Systems, Inc. This information is provided for consumers' personal, non-commercial use and may not be used for any purpose other than to identify prospective properties consumers may be interested in purchasing.